MALAYSIA is studying the possibility of linking the high-speed rail (HSR) system from Kuala Lumpur to Thailand, and to other Southeast Asian countries, says Transport Minister Datuk Seri Kong Cho Ha. “We want to provide connectivity beyond Thailand. But to do this, you would need government to government understanding and we have not come to that yet,” Kong said. “High-speed trains today are more convenient and is a faster mode of transportation, from city to city , than flying,” he said yesterday, at the signing of a memorandum of arrangement (MOA) between the Ministry of Transport and China’s CSR Group. It is learnt the government is mulling providing rail connectivity from Kuala Lumpur to Thailand, Laos, Vietnam and several cities in China. The Land Public Transport Commission (SPAD) is currently doing a study on the HSR to link Kuala Lumpur and Singapore. The study is expected to be completed by the end of the year. If found feasible, SPAD will call for pre-qualification bids by mid-2013. Kong said several options and alignments are being explored for the Kuala Lumpur-Singapore route. “The train could either runnon-stop from Kuala Lumpur to Singapore, or start from KL Sentral and have stops at the Kuala Lumpur International Airport, Seremban and beyond that,” he said. Asked whether the government was eyeing the use of the magnetic levitation (maglev) technology, Kong said no decision has been made. Co Ltd. It was witnessed by Prime Minister Datuk Seri Najib Razak, Kong, China’s Ambassador to Malaysia Chai Xi and CSR vice-president Fu Jianguo. Meanwhile, Kong said participants at the recent Innotransconvention, the world’s biggest rail industry event in Berlin, Germany have expressed interest to work on railway projects in Malaysia. by several European and Asian companies to use their technology. The companies included Bombardier, Rotem, Alstom, CAF, Ansaldo, Hitachi and CSR. “There are many things happening in the railway sector here. We have the MRT, the LRT extension, ongoing double tracking works, with the possibility of the HSR being implemented. “There is also the rapid transit system from Johor Bahru to Singapore. 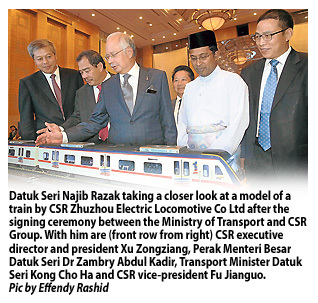 So there is a lot of potential for rail technology and suppliers,” Kong said.